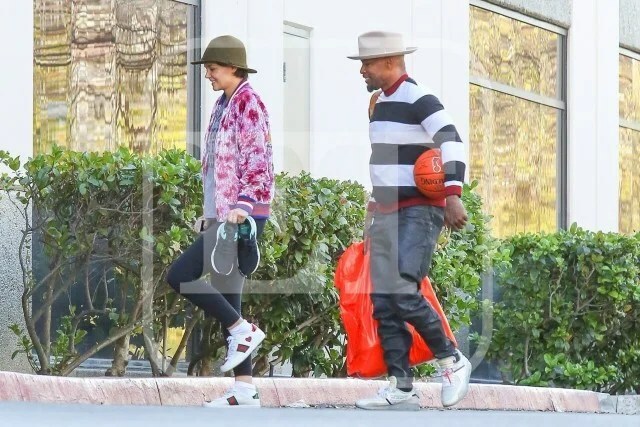 Katie Holmes and Jamie Foxx has been purportedly dating since 2013. However the couple has downplayed their romance due to a clause in Katie divorce agreement that states she cannot publicly date anyone until five years have passed following the end of her marriage to Tom Cruise. Well the five years has passed and we are seeing more of the couple on the scene. The were last spotted at Clive Davis annual grammy party. According to ET the couple, who has kept their romance under wraps for the last few years, made a rare appearance on Wednesday to celebrate Valentine’s Day with a game of basketball. A source tells ET that Foxx picked up Holmes at her house on Wednesday afternoon. Holmes was all smiles while walking to the court with Foxx, who came equipped with a ball and a big Nike bag. The actress, meanwhile, carried a pair of sneakers with her, as she appeared to shimmy down the street. “She was doing this funny little dance as they walked in, and Jamie was laughing,” ET’s source says. Previous Post First Photos of Ciara and Russell Wilson daughter Sienna!